What a quick, easy and delicious dessert :) Everyone seems to love it! - Wash and dry the strawberries. Make sure they are dry, otherwise the chocolate won't stick. - Melt the milk and white chocolate in two separate bowls for 30-40 seconds in the microwave. Make sure the chocolate is creamy, not liquid. - Holding the strawberries by the stems, dip each one in milk or white chocolate and place on a baking sheet or foil. 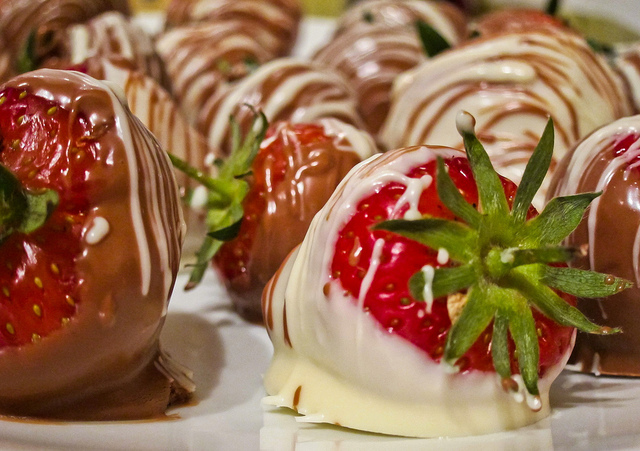 - To create the lines, use a teaspoon filled with chocolate and quickly drizzle it over the strawberries moving your hand from right to left and back. - Place them in the fridge to cool and enjoy!